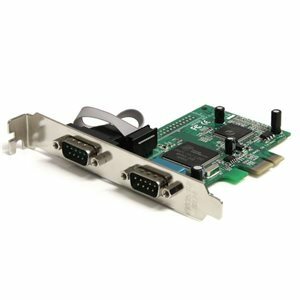 Add 2 RS232 serial ports to your standard or small form factor computer through a PCI Express expansion slot. The PEX2S950 2 Port PCI Express RS232 Serial Adapter Card with 16950 UART can be installed into an available PCI Express slot, to provide two high performance 16C950 RS232 serial UART channels/ports - a convenient solution for connecting modern or legacy serial devices with support for data transfer rates of up to 460 Kbps.The 2 port RS232 serial card is easy to install and configure, with support for a broad range of Windows operating systems. Plus, the card features IRQ sharing and supports plug and play serial device connections, guaranteeing convenient, hassle-free installation. The 2 port RS232 serial card is easy to install and configure, with support for a broad range of Windows operating systems. Plus, the card features IRQ sharing and supports plug and play serial device connections, guaranteeing convenient, hassle-free installation. The PEX2S950 2 Port PCI Express RS232 Serial Adapter Card is backed by a StarTech.com lifetime warranty and free lifetime technical support.